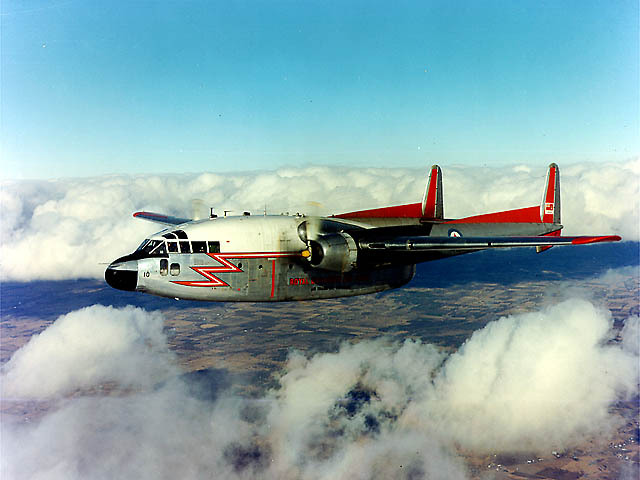 On July 25, 1961, our group of twenty-three was packed and ready for lift-off, the assigned transport an Air Force, Fairchild, C-119 Flying Boxcar, a supply and troop transport. For troops (and wannabe firemen), canvas slings hanging from the sides of the fuselage, provided a place to sit but little in the way of comfort. Immediately outside the fuselage the roar of the two 1500 hp radial engines made conversation nearly impossible. With a painstakingly slow cruising speed of 200 mph, it was a long, bladder filled trip to Winnipeg where we stopped for a bathroom break, quick lunch and change of flight crew. By early afternoon we were off for the ten hour leg to Trenton. After a late dinner we bunked down but did not get much sleep that night as we all seemed to be giddy from the long flight and thinking about the new experience that awaited. Early the next morning we left by bus for the final 120 mile leg to Camp Borden. As civilians we were assigned barracks separate from regular recruits – I suppose the brass didn’t want our rag-tag group of civilians to unduly contaminate their sparkling fresh troops. The accommodation and food was great but we generally stood out like sore thumbs in the mess hall and around the base where all military personnel sported freshly pressed uniforms and spit polished boots. By the sarcastic comments directed our way, it was clear the regulars didn’t view us with high esteem. From the course overview given over the first few days, it was certain the next several weeks would be hard work, both in class and in the field, as first we studied, then put into practice, the skills required to become top-notch crash rescue fire fighters. The real shocker came on our first visit to the practice area with Corporal Breckinridge, our field trainer. Breckinridge, a man in his early 40s with a soft gravely voice, was easy to like. He came across as a man who knew his job and who was willing to work hard to teach his batch of raw recruits everything possible about basic crash rescue fire fighting. 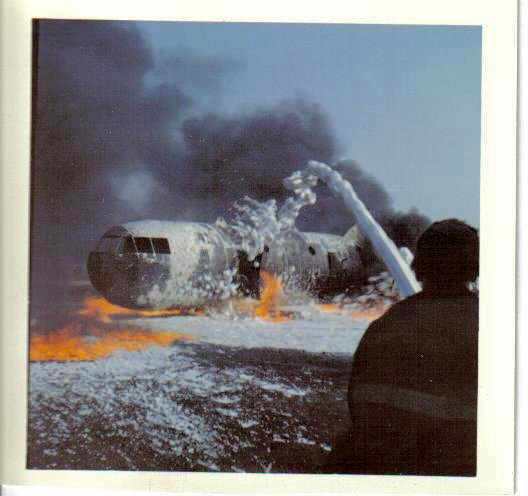 The first lesson – a demonstration of the dangers involved in dealing with a large, fuel based fire that could be expected to accompany an aircraft crash. The demonstration caused many us to wonder if we had chosen the right career path. In the training area a large steel culvert, modified to resemble an aircraft body, stood in mute silence. After pouring several hundred gallons of aviation fuel inside and around the culvert, Breckinridge lit a thunder flash then calmly tossed it into the pooled liquid. The resulting explosion was thunderous and flames engulfed the metal mock-up. To a man we backed away from the intense heat and acrid smoke. Breckinridge told us that with a couple of weeks of practice we would all feel completely comfortable walking into that raging inferno. Assuredly we held doubts but Breckinridge was strong leader who inspired confidence with his words. He then donned his protective gear and disappeared in the raging inferno. When he emerged (to all appearances unscathed) he summonsed a foam equipped fire truck and the flames were quickly extinguished. 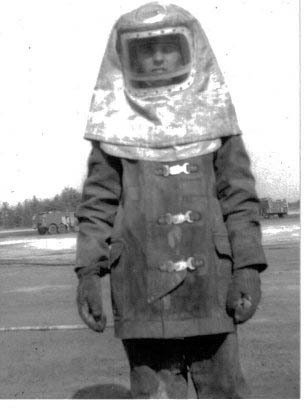 He then instructed us to ‘suit up’ as a smaller pool of gas was dumped in the training area. After being lit, Breckenridge gently guided small groups though the flames as a demonstration of the ability of the protective gear to prevent our being burned to a cinder. It was only by shear force of will, and the gentle encouragement of Corporal Breckinridge, that we were able to walk through those first fires. Photo: The Fire Walkers get up close and personal with a gas fire. Early in training handlines were held in readiness as we walked through the flames. 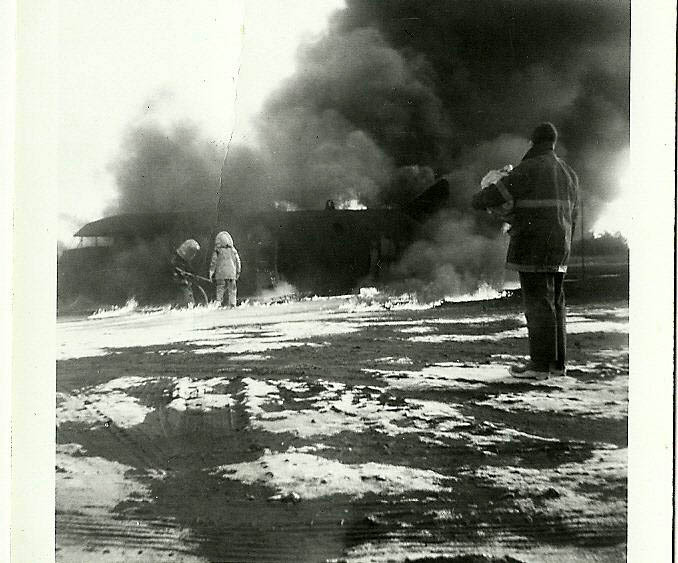 Photo courtesy of Frank Fertich, an RCAF Fireman. Over the next several weeks we learned the theory and, in the field, how to apply foam, dry chemical and a finely misted spray of water to knock down flames. 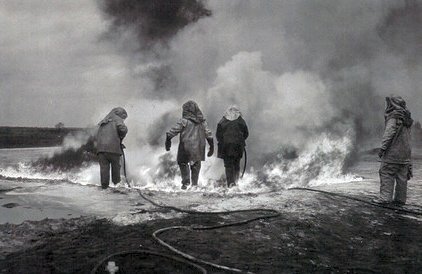 We were soon able, if not totally comfortable, walking through the smoke and flames in order to ‘rescue’ pails filled with sand. 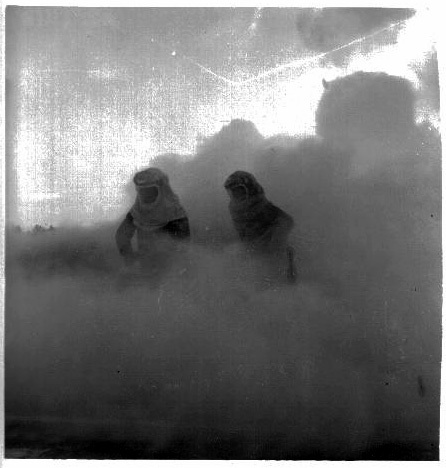 While the fire retardant suits worked well, we had to take care that our wool under garments were properly worn. If not, ‘hot spots’ could easily develop, especially in the boots. When this happened it was not uncommon to see one of the recruits rush to the side of the training area and rip off his boots or other gear that had become overheated. Photo: Fire protective gear. Note the fireman does not wear any breathing equipment under the helmet. 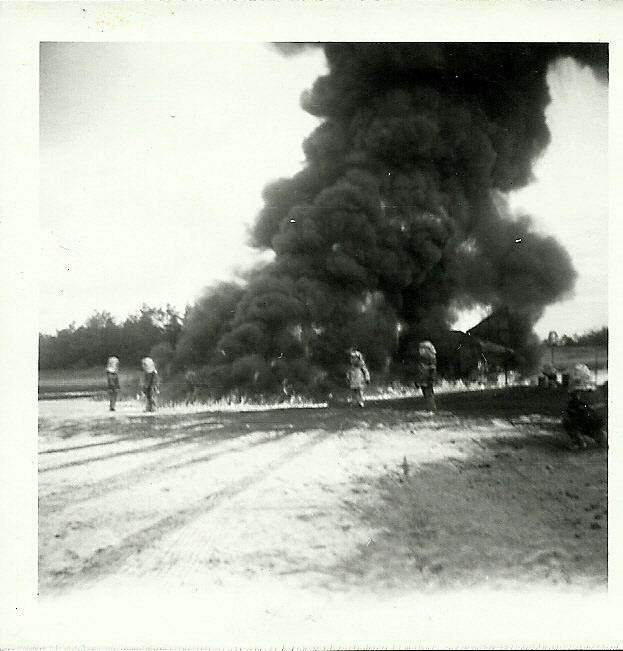 One of the challenges of walking into an area filled with acrid smoke was holding our breath while we rescued the sand pails and made a safe exit. Those who could not hold out and tried to catch a breath would find their lungs filled with sufficient fumes to keep them coughing for several minutes. After we each suffered that experience we better understood why Corporal Breckinridge periodically left the training area or class seized by a coughing spasm that would cause him to double over. Week after week Corporal Breckinridge accompanied each recruit as he taught us to calmly and methodically attack a wall of flames. While each of us had only to enter the inferno one or two times a day, Breckinridge would enter several times. In retrospect, it takes little imagination to understand how this must have affected his lungs after several years of teaching. As starting this series of stories, I now wonder what became of that great teacher. Perhaps through the records at Camp Borden an answer can be found. The man certainly deserved to be honoured for his selfless service to others. While most of our time was taken at the school or studying in barracks, at few of us managed to catch an occasional week-end away from the base. It was my good fortune to have an Uncle, Sergeant Allen Hartley, a tank warfare instructor at Borden, and his wife, my Aunt Marcia Hartley (Wheeler), my mother’s sister, living in Alliston, just eight miles from the base. Uncle Al and Aunt Marcia would lend us their car and, along with four or five chums, we toured the local hot spots, like Barrie, looking to taste of the night life. We managed to catch a few concerts (Johnny Cash, The Cascades – both before they became stars), meet a few girls (we could compete with the military as Guy Venne made sure they knew we were “USAF SAC” (a step above the RCAF recruits)) and, even though the drinking age was 21 in Ontario, we managed to score a few cases of beer for our parties. One trip, on the September long week-end, took us to Niagara Falls and Buffalo. The reason for traveling to Buffalo was to find a bar where we could legally drink (granted we already had a lot of practice). It was one of those lost week-ends that will be long remembered for having been locked inside the gates of Goat Island (US side of Niagara Falls) with a few other young people we had met in a Buffalo bar and were showing the Canadians the sights. On the return trip, on Sunday, we stopped at a drag race-way just outside Buffalo to see, for the first time, high powered dragsters. On our way back to the border we still had a couple of cases of beer which we knew we couldn’t take into Canada, so stopped by a construction site and strategically placed the bottles as a surprise for the Monday morning work crew. Hey, those American folks gave as a job (and all those nuclear weapons to protect our country) the least we could do was leave a few beer behind as a thank-you. While a week-end away were a rarity, it did give us a chance glipse the night life and to see the beauty of southern Ontario as the full splendour of fall colors began to appear. All too soon our training time came to a close and we headed back to Cold Lake to continue our adventures in the Cold War. Camp Borden, Training Area. Recruit with a handline learns to knock down major fire areas using foam. Photo courtesy of David Birtwhistle, RCAF Fireman. Camp Borden, Training area. Under the watchful eye of an instructor, two firemen continue to knockdown flames in preparation for entering to affect a rescue. Photo Courtesy of David Birtwhistle. surround to trainees exiting the mockup. 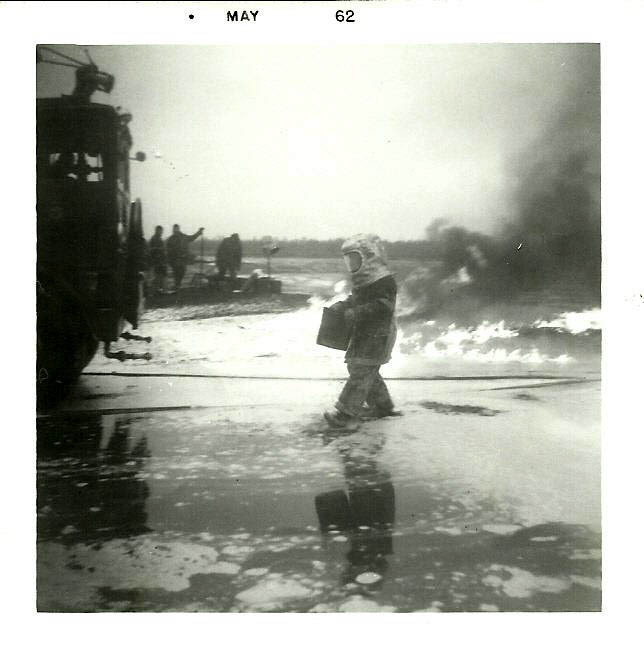 Camp Borden, Training Area: Fire trainee from Cold Lake SAC Base removes sand pail after fire has been knocked down. Photo courtesy of Raymond Birn, SAC Trainee. 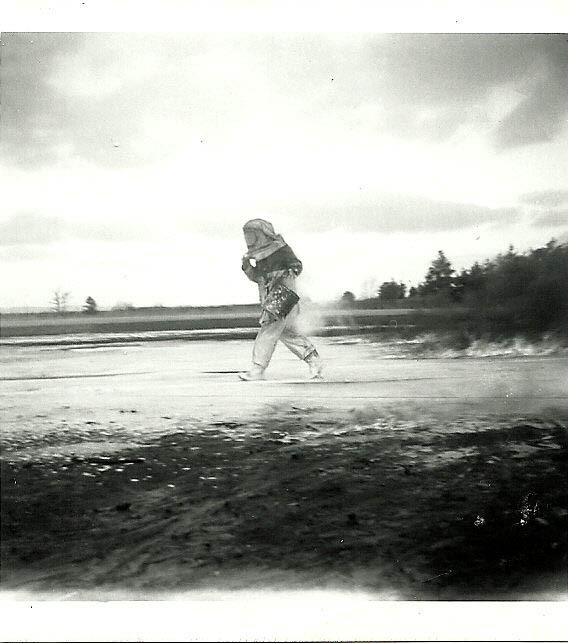 Date on photo suggest film was not developed until several months after return to Cold Lake from Camp Borden. Camp Borden, Training Area: A Cold Lake SAC fire trainee drops his pail of sand and hot foots away from crash scene ready to remove his mask. It appears he was choking from the acrid smoke or had developed a ‘hot spot’ in his gear. Photo courtesy of SAC Trainee Raymond Birn.